Every Friday I’ll be reviewing two books (usually comic books from NetGalley). Today’s post is a bit of a change of pace as both of these books are actually collections of ongoing web-comics. We’ve got a girl who fights monsters, and one who lets them play with her cat. G ronk follows the eponymous monster as she leaves the big woods in search of a life that doesn’t involve scaring people. Gronk has never fit in with the monster life, and is teased by the other monsters, so she sets out way from the deep dark woods. Soon she finds a young artist who quickly sees that Gronk is not a monster inside and gives her a home with her cat and 160 pound Newfie. This is mostly a cute gag of the week comic with little narrative thread. 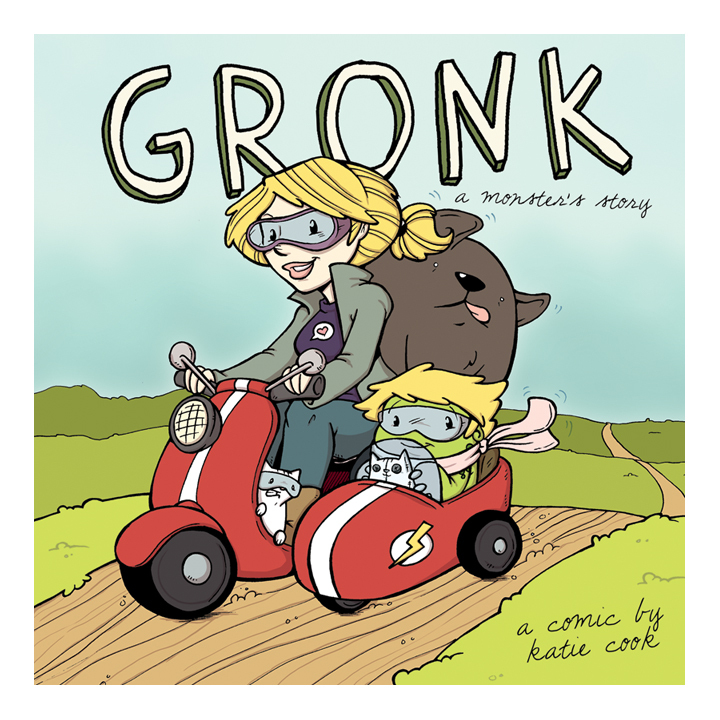 It’s appropriate for all ages, with most of the humor deriving from Gronk discovering things about our world, and the particular nerd sensibilities of the artist. Another point of interest are the different shirts that Dale (the artist) is sporting in each comic, often with obscure code or nerd references. The art is cute and simply colored. Most of these originally appeared in black and white on the site but have been colored for the book. This is a very quick read (I think I knocked most of it back waiting for pizza at Marcos), and at $9.99 60 pages feels a little thin. The site posts on an irregular schedule, and the books that have been printed so far contain about a year’s worth of comics which works out to about 50-60 each book. That said there are probably a couple of these that you’d want to put up in your cube either for the humor or the extreme cuteness, and if you want to support the artist go ahead and pick up the book. For me this is probably another one of the ones I’ll infrequently check online. Strong Female Protagonist follows the adventures of Allison Green (a.k.a. Mega Girl) as she tries to adjust to post super hero life by going to college and trying to find a way to save the world that doesn’t involve smashing giant robots. In this volume we flash back to the moment Allison decided to give up the mantle of Mega Girl and the impact that has had on herself, and her fellow biodynamics (the author’s term for those with super-powers). This comic is a bit like Watchmen crossed with John Byrne’s Next Men with a little XKCD thrown in for flair plus a lot of heart. Each page features a wry comment or extra joke from the author (a la XKCD though a technique that’s popular elsewhere). In this world like Next Men, super powers are not always a gift. One villain has blades for hands that are actually cancerous lesions that are slowly killing him from the inside. Another hero, Feral, can heal from any injury, and because she wants to help others has chosen a life of extreme pain and limited mobility in order to give as much of herself as possible. Even Mega Girl who is basically invincible worries that her strength will cause undue harm to those around her. But the best moments in this story are the simple interactions, whether it’s between Allison and her former nemesis Menace, or her family life, we spend less time fighting the typical super hero fights and more time getting to know these heroes and villains as people. Each chapter or issue of this volume reads like an individual comic book (though more of an annual length than a single issue), with some connective tissue. There are some plot threads introduced in the first chapter that feel a little forgotten by the last (which given the webcomics’ schedule would be about two years later), but the author may pick these up in future chapters. Another of my favorite comics is MegaTokyo, which has a VERY irregular schedule but tries to do a similar thing in delivering pages of a book rather than just a gag of the week format. It’s a shame more web comics don’t follow this format, though it can be a little frustrating to follow from week to week. We’re about 88 pages into Issue 5 on the website (the book reviewed here contains 1-4), but that’s at a rate of two pages a week. Probably this is the kind of thing you’ll want to check in with once or twice a year and read the whole backlog (or buy the books). This is one of the best comics I’ve read in a while and is playing on a whole bunch of levels. I even found myself with a bit of a tear in my eye by the last page of Issue 4. But I also found myself laughing like crazy as well (Check out this comic and maybe the one right before it, particularly if you’ve got humor sensibilities like my friend Brian). You owe it to yourself to at least give this one a look.